A recent poll by the Pew Research Center reveals that while a majority of Democrats opposed government spying under the administration of George W. Bush, they do support spying programs put in place by the Obama administration. However, a group of displeased Democrats recently broke ranks to protest the NSA surveillance programs at a fundraiser for House Minority Leader Nancy Pelosi, targeting her for her staunch defense of the Obama administration’s spying programs. Here’s a clip of that protest. CROWD: First Amendment, Fourth Amendment, Fifth Amendment, yes. Second amendment, Second Amendment, that’s how you protect the rest. Fifth Amendment yes. First Amendment, Fourth Amendment, Fifth Amendment, yes. NOOR: Now joining us to talk more about this protest and the reasons behind it is Norman Solomon. He’s the founding director of the Institute of Public Accuracy, cofounder of RootsAction.org. He cochairs the Coalition for Grassroots Progress, which sponsored the July 13 protest against NSA surveillance that picketed a high-dollar Democratic Party fundraiser honoring Nancy Pelosi. He’s the author of a dozen books, including War Made Easy: How Presidents and Pundits Keep Spinning Us to Death. Thank you for joining us, Norman. NORMAN SOLOMON, COFOUNDER, ROOTSACTION.ORG: It’s a pleasure. Thank you. NOOR: So talk about the reasons behind this protest and why target Nancy Pelosi. SOLOMON: Yeah. The protest is really a reflection, I think, of growing disquiet among many people, no matter what their party identification, with the Obama administration’s continued effort to defend the NSA surveillance program, really violating the First, Fourth, and Fifth Amendments. And we had here in the North Bay, just north of the Golden Gate Bridge, just a few days’ notice after we learned that a private fundraiser for the Democratic Party was headlining Nancy Pelosi, the minority leader in the House, who has been really clear in her defense of the Obama administration’s NSA surveillance program. So here basically we have the most powerful Democrat in the House in our backyard raising money, somebody who’s defending the indefensible, these terrible violations of civil liberties. 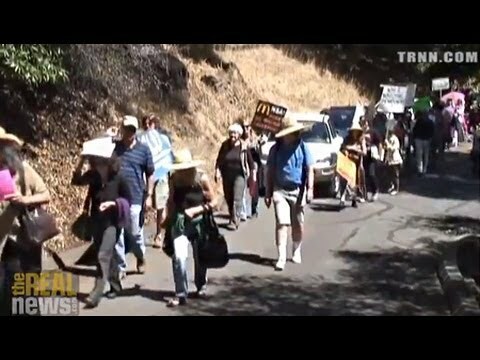 So we gathered into this very expensive, wealthy neighborhood, somewhat obscure in location up these winding roads, and we had about 70 people actually picketing at and near the house where the fundraiser was taking place. NOOR: So, Norman, as Glenn Greenwald has pointed out in his articles discussing the fallout of this, of the NSA leaks, it’s been the Democrats that have been the staunchest defenders of the Obama administration’s spying and the fiercest critics of Edward Snowden. Specifically, Nancy Pelosi herself, she spoke out at Netroots conference, a progressive conference, in defense of the spying programs. Here’s a clip of what she said a few weeks ago. NANCY PELOSI, MINORITY LEADER, U.S. HOUSE OF REPRESENTATIVES: –welcome the challenges that people pose, because I think that those answers–those questions must be answered. And as far as Snowden, he did–you know, I may be in disagreement with you–he did violate the law in terms of releasing those documents. We don’t know. [boos] I understand. I understand. I understand. But it did violate the law. And the fact is that, again, we have to have the balance between security and privacy. NOOR: So, Norman, what’s your response to what Nancy Pelosi was saying or trying to say in that clip? SOLOMON: Well, yes, she was floundering trying to remember her talking points. Really, this is symptomatic of the top Democratic Party national leadership, where you have not only Pelosi; you have Henry Reed of the Senate, you have the upper strata of the Democratic Party folks in Congress–here in California Senator Dianne Feinstein, chair of the Senate Intelligence Committee–even more vociferous in defending this unconscionable surveillance. And I think it goes to the fact that it’s the Obama administration which is perpetrating and extending this kind of surveillance that was really boosted by the Bush administration. And this is a sort of circle the wagons around our own party sort of response by so many Democrats in Congress. There is, I think, growing fissure which needs to grow a lot more between the top Democratic Party leadership and a lot of people who call themselves Democrats and who are rank-and-file or activist leaders around the country. One example is that at our Marin County protest picketing Nancy Pelosi at this fundraiser days ago, among the speakers was Caroline Banuelos. She is the chair of the Sonoma County Latino Democratic Club. She’s the Northern California chair of the California Democratic Party’s progressive Caucus, which is the largest caucus of the largest state Democratic Party in the country. So that is a reflection, I think, of what’s involved here. We had on short notice a fairly small but I think high-impact picket where we were literally and figuratively not supposed to go, where a bunch of rich people were gathering to support the Democratic Party’s congressional campaign funding to the tune of up to $32,400 per couple. And what I think needs to happen now on this issue in terms of the grassroots is that people around the country challenge those who are in Congress who are of the party of the administration that is perpetrating this horrendous violation of our civil liberties. And that, I think, is an opportunity here in late summer. In the month of August, you have members of Congress fanning out to their home districts around the country, doing town halls or trying to avoid doing authentic town halls, but they’re doing public appearances. And I would really urge people. Everybody’s got a congressperson of whatever party, but perhaps of particular importance if they’re Democrats. They should be challenged. They should be nonviolently confronted. This needs to be made a huge issue in late summer. NOOR: And a lot of those leaders you mentioned, I bet they were protesting President Bush’s spying when he was carrying them out. SOLOMON: Yes. Well, you know, not enough, but there was a lot more pushback and rhetoric against the surveillance by the NSA and so forth, phone wiretaps domestically, when it was a Republican in the White House doing it and Democrats could sort of make some political hay. This is really part of the terrain we’re in now, and many issues are of crucial importance. A bedrock of our capacity to develop democratic action is civil liberties. I mean, you look at not only freedom of the press, which because of the monitoring and surveillance of the phone records of Associated Press and so forth have been abrogated. Then you’ve got the Fourth Amendment. The whole thing is being violated as a whole by the Obama administration, and then due process of the Fifth Amendment. So this is the kind of assault on basic freedoms that is just not acceptable. And this is the summer of our discontent that more opposition needs to be vocally and visibly launched against these kind of programs coming out of the White House. NOOR: And so we don’t know how much the NSA spends on these surveillance programs, but we do know it’s a massive amount and that government contractors are making a killing off these programs. How much influence do they have over the Democrats in supporting and defending these programs? SOLOMON: Well, these are basically bipartisan programs. And as you say, massive amounts, billions of dollars, are being doled out to private megacompanies, for the most part. The division between or separation between the government and corporations when it comes to so-called intelligence, that’s disappeared just about to the vanishing point. By most accounts, up to 70 percent of the tax dollars going to intelligence and surveillance and so forth is going directly to contracting private firms. And what we have is really one hand washing the other. When you think about it, we now have a military-industrial-digital complex, where the cutting edge is overwhelmingly in the private sphere. And so these huge conglomerates such as the one that Edward Snowden was working for, Booz Allen Hamilton, when he was able to divulge this vital information, these folks are way ahead technically of the government. And so the government is paying them huge amounts of money and boosting profits, which is, after all, what the corporate capitalist enterprises are really about. And in turn, those corporations are giving to the White House and the administration and the government, the so-called intelligence agencies–what they want is the capacity to use tighter surveillance through digital means to tighten political control. And so we have this fusion of government power and corporate power that has to be challenged directly. And that’s why I really urge people to directly challenge those in office and say these violations of civil liberties are unacceptable. I have to say that I’m very proud, together with Jeff Cohen, having cofounded RootsAction.org. We have now several hundred thousand members who have been responding to our appeals for, for instance, hands off Edward Snowden, to insist that the U.S. government should not abduct, kidnap, or otherwise grab hold of Edward Snowden as he seeks political asylum. And folks who want to be part of that process can go to RootsAction.org, sign our appeal, and be part of this effort. NOOR: Norman Solomon, thank you so much for joining us.